Souping is a new way to cleanse the body. 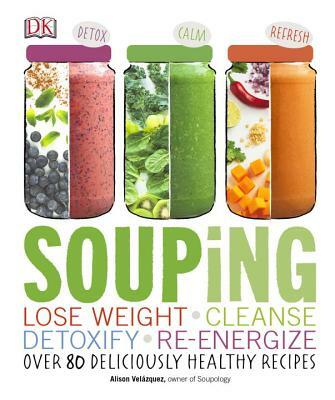 Packed with more than 80 delicious and incredibly healthy recipes that can be eaten on the go, Souping is the first-ever cookbook of its kind to cover this trend. Step-by-step instructions for making and storing each savory, sweet, filling, energizing, or calming soup make souping easy, and nutritional breakdowns and explanations of the health benefits of key ingredients allow you to track your progress. Both time- and goal-based plans ranging from one to seven days outline day-by-day menus, never offering the same meal twice. Alison Velázquez is a wellness professional and the owner of Soupology, a unique cleansing program focusing on healthy soups as its cornerstone. She specializes in wellness or spa cooking, which focuses on the use of seasonal ingredients to create light, innovative fare. She lives in Chicago, Illinois.